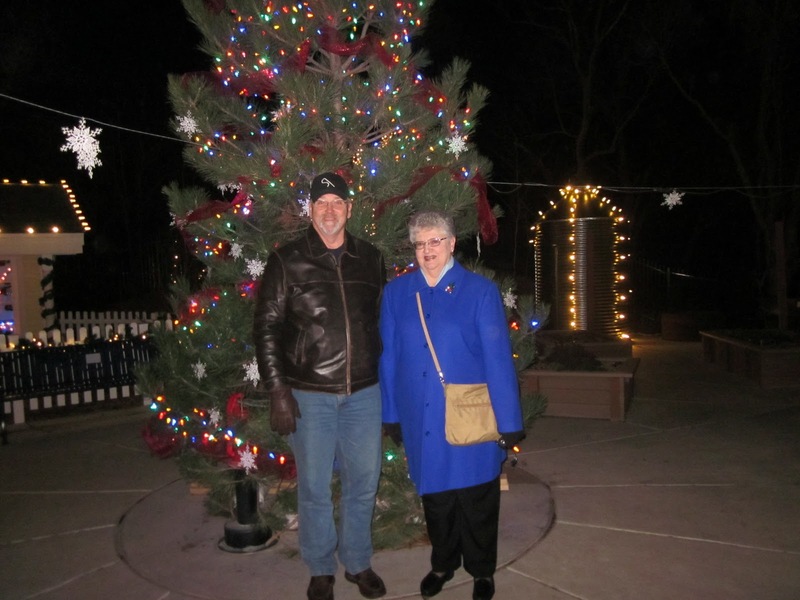 December 2011 – He Said What?! Aaron notices a person’s characteristics and will, of course, talk about them. We just usually hope he’ll wait to do the talking until he isn’t in that person’s presence. That’s because often his observations are…….well…….blunt, let’s just say. Not necessarily complimentary. In other ways he may even sound derogatory, like talking about some one’s skin color, eye shape, etc. Those are very touchy subjects and we have talked until we’re blue in the face to him about not saying anything about any one’s race or gender or ANYTHING!!! Just be nice to everybody, Aaron, and appreciate their uniqueness. And actually, if our faces turned blue I can only imagine what Aaron would have to say about THAT!! We have taught Aaron that God loves all people and that we should love all people, too. So when Aaron talks about someone, he isn’t doing it in a malicious way. It’s just that he notices everything about his surroundings and the people in those surroundings – and he WILL talk about it, do or die! He’ll observe someone and then say, “That’s weird!” or “They’re weird!” – and off he’ll chatter as he tells us why they are “weird.” It may be hair color, piercings, weight (look in the mirror, Aaron! ), accent, skin color, or any number of other personal traits. Since I had not received a phone call about Aaron being banned from Subway or arrested, and he didn’t have a slap mark across his face, I was hoping that this mother understood and was patient with Aaron. He said that the girl’s mother told him it was a birthmark. Bless her heart. I know that Aaron’s remark may have opened a wound and I appreciate what I assume was kindness that she showed toward Aaron’s insensitivity. I also have to say that I am thankful I wasn’t there to suffer the embarrassment that this would have caused. Sigh. Anyway, Aaron wanted to know all about birthmarks and so that led to a long conversation about what a birthmark is, and what NOT to say. Aaron has a very hard time with what NOT to say, believe me! No, Aaron, I have no idea what an accent from the west that is also from the European sounds like. But without looking, since I couldn’t see the TV, I’d say he sounds like he’s from India. See? Aaron’s intriguing little doctor from India is full of characteristics that capture Aaron’s attention – and he doesn’t miss any of them! Really, Aaron? Tau does not sound remotely African to me, but I realize that I could be wrong. I wasn’t. Aaron was delighted when I met Tau one day in our driveway when she dropped Aaron off. Tau is as Oriental as she can be. In front of Tau, Aaron bent over at his waist and rubbed his hands together in delight as he told me to ask her where she’s from. Oh Aaron. Tau just laughed as I told her that Aaron was wondering where she was from. She answered with a smile and said, “I’m from Vietnam.” When I told her that Aaron thought she was African, she threw her head back and laughed loudly. We look at maps with Aaron. We point out where country’s are located. But we don’t like to talk about how people look and that this person who looks this way is probably from this country. I don’t know – maybe we need to because I can only imagine what Aaron has in mind when he talks about someone who lives in Vietnam but is African with an accent from the west that is from the European. Author hesaidwhatksPosted on December 30, 2011 Categories Uncategorized2 Comments on Where is He From?! I went on down to the kitchen table to move everything out of the way and shuffle the cards. Soon I heard Aaron’s heavy thump, thump, thump down the stairs. There he came, carrying his ever-present clock and his hand towel that he takes everywhere. The towel is for him to wipe his hands on when he eats a snack. Napkins are for meals and the towel is for snacks. He detests getting his hands messy with crumbs, salt, – or anything! The towel is his lifesaver for keeping his fingers clean. 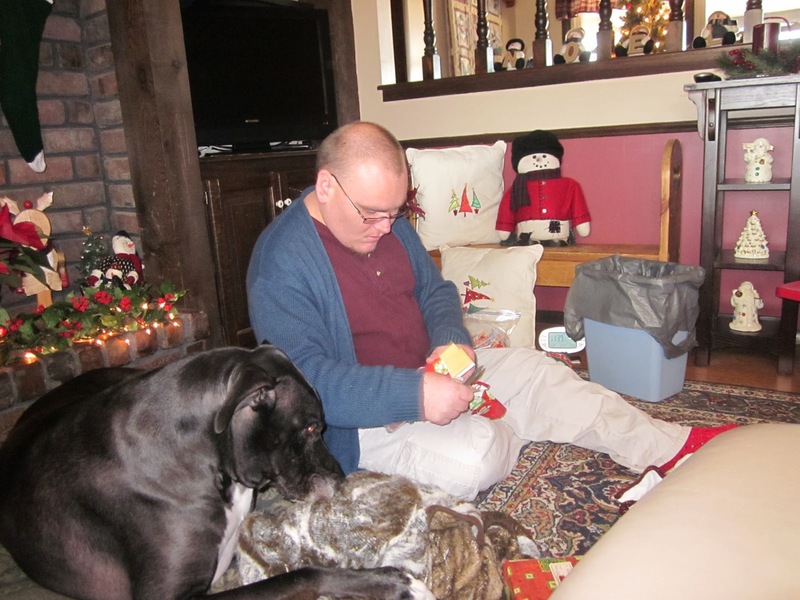 Soon he had chosen his snack – tortilla chips – one of his favorites. You can see in the picture that he got out two bowls. One bowl holds some chips. The other bowl holds any crumbs that fall when he bites the chip. No, crumbs cannot fall back into the chip bowl. Such a thing is not allowed at all! He takes a chip from the chip bowl, bites the chip while leaning over the crumb bowl, then gives the chip a few shakes into the crumb bowl, and repeats the process until the chip is eaten. As soon as the chip is all in his mouth and his hand is empty, he reaches over to his towel and wipes his fingers clean. Every single chip is eaten this way…………..bite the chip, shake the chip over the crumb bowl, bite the chip again, shake again, and wipe his fingers when the chip is gone. Very methodical…………..very interesting……………very Aaron. Tonight he said, “Mom, the people who made these chips didn’t do a very good job.” When I asked why he thought that, he replied, “Because they’re bubbly!” Yep, the chips had little air pockets that made more crumbs than usual when he bit them, so his crumb bowl was getting very crumbly as he shook and shook each chip. Shaking the chip into the crumb bowl – with his towel by his side. 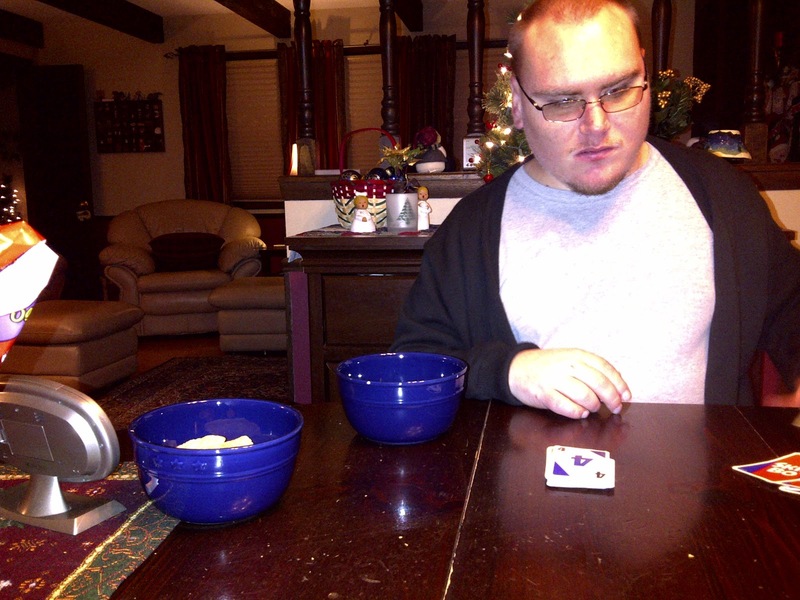 Skip-Bo is Aaron’s favorite game and he never tires of playing. He likes how sequential it is – orderly and sensible. He rarely uses the strategies that the rules recommend, yet he often beats me. I do have to watch him because he can at times be a sneaky cheat. I know that’s not a character trait to admire, but I have to say that his ability to think of ways to cheat shows me once again that he really is smart. Some days I’ll take it in whatever form it comes! He likes to keep a record of our wins, as you can see in the picture. I’m swallowing my pride and showing you that he is WAY ahead of his mother! 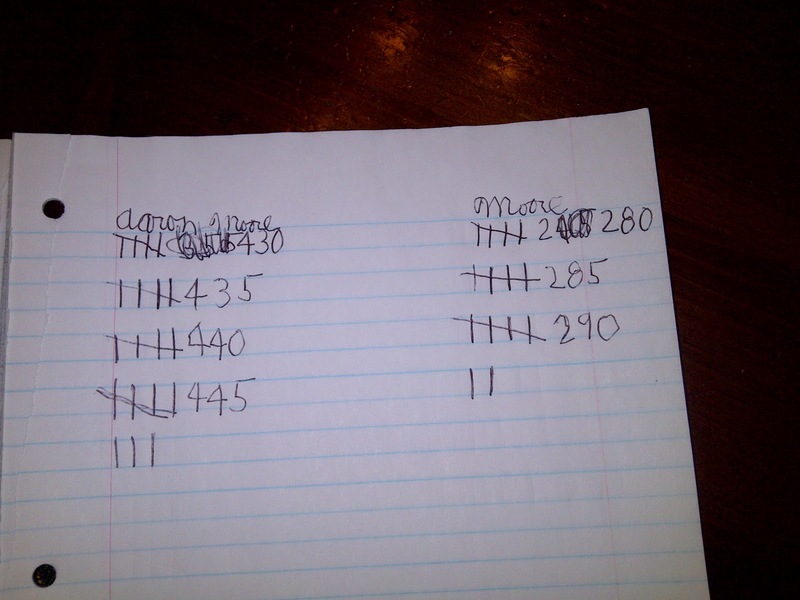 He usually puts Mom in the right column but for some reason on this sheet it says Moore………..but that’s me. You can tell because I’m way behind. Maybe I need to double check his counting. He may be cheating at that, too! 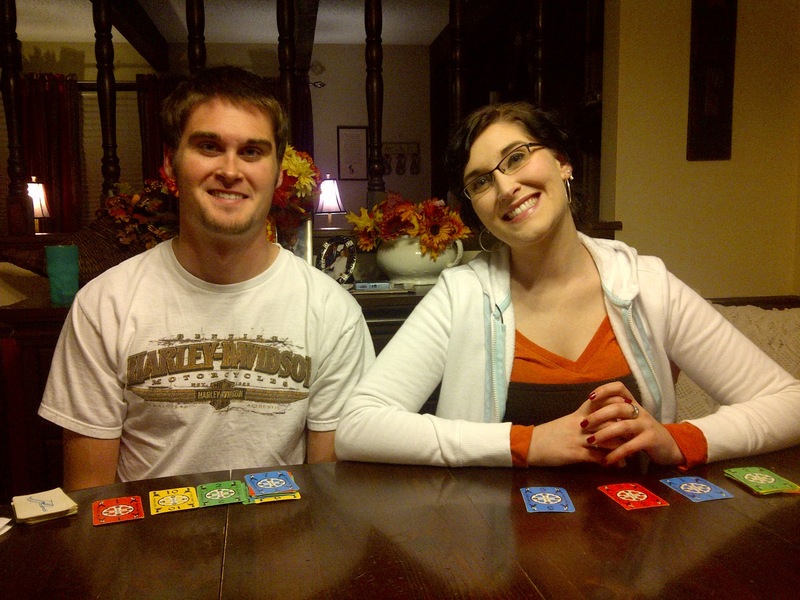 Playing Skip-Bo is a good way for both of us to unwind at the end of the day. It’s a great chance for Aaron to talk and for me to hear more about his day – or what he’s reading – or what he has eaten – or what movie he wants to see or to buy – or what the weather is or the temperature outside according to his faithful clock – or how annoyingly bubbly his tortilla chips are. Whole lotta shakin’ goin’ on!! Aaron fell on our stairs awhile back and skinned up his leg. When something like that happens, he will talk and talk about it – to the point that I sometimes hardly pay it much attention. Yes, Aaron, your leg hurts but it’s because you fell and now it’s healing nicely and you’ll be fine and…………. So this week, on Monday night, I didn’t give it much thought when he complained about his leg hurting. He went on about it, though, and so I finally told him to pull up his pajama pants leg and let me look. I was shocked to find his left leg and foot swollen, red, and hot. Last June Aaron had Cellulitis in his left arm and this sure looked like the same thing. Tuesday morning found us down at McConnell Air Base to see Aaron’s primary care doctor. The doctor and PA there were concerned that he might have a blood clot, so they sent us straight to the emergency room for a scan of Aaron’s leg. This was turning into a huge and rather exciting adventure for Aaron. He doesn’t usually have any fear of medical procedures, which is a blessing, but instead views it as another time to see different things and talk to new people. And of course, our quick in-the-van Burger King lunch only confirmed to him that even a very sore leg can have some pretty decent pay-offs! Soon we were pulling into the Saint Teresa Emergency Room parking lot and Aaron limped inside with me in the lead. We were immediately checked in and ushered into an exam room. Aaron loves talking to the nurses and EMTs, and they were soon smiling at some of his comments. It’s hard to get an accurate picture of what’s going on with him because when they would ask about his leg, he would go off about falling on the stairs or about how it hurt at Paradigm – like they should know all about his day group – and on and on he would go – so I would take over and explain everything while he sat there trying to interrupt with his own story. The exam by the doctor led to an ultrasound of his leg and the good result of no blood clot. This was Cellulitis for sure. I was hoping that the doctor would confirm my theory that the infection was a result of Aaron not keeping himself clean enough and would give him a nice lecture on how to take a better shower. Aaron knew that this is what I believed – I had discussed it with him earlier. So I asked the doctor about this issue and he answered, “Well, actually, that has nothing to do with this infection.” Whereupon Aaron quickly turned his head to me and stuck his tongue out at me. The doctor thought this was hilarious and said to Aaron, “So you won this one, didn’t you? !” Aaron was very pleased with himself for sure! The nurses put an IV in one arm and drew blood, and then took more blood from the other arm. Aaron barely flinched when he was poked and stuck. He was focused on the bag of Mike and Ikes he had seen in the vending machine in the hall. He spied those right away and they became his focus from that point on. He got to watch some television – Looney Tunes! – and then napped while we waited for the scan results and during the hour it took for the IV antibiotic to be dispensed. Finally we were released and went on to Dillons to get his prescription filled – and walked out with some Mike and Ikes in tow, of course! He notices everything – how the TV remote was different, the kind of blanket they put on him, the sound of his blood flow during the ultrasound, etc. It’s all an adventure to him and a chance to tell many stories when he got home. At home, he went up to Andrea, who works there at St. Teresa, stuck his bandaged arms out and said, “Here. You work at the hospital. Will you take my bandaids off?” He does love the pampering and attention! But the best part was yesterday when he said, “Mom, is my Cellulite better?” Cellulite! I don’t know about your Cellulite, Aaron, but let me tell you about mine! Football season is not over – for the nation and for the Moore family. Aaron is still enjoying the game whenever we have it on………..and he still has interesting and varied insights. Yesterday I had football on while I wrapped Christmas presents. Aaron’s eyes lit up when he walked into the family room and saw the familiar Chiefs on the screen. Up to his room he clomped and soon returned, wearing his pajamas………..it doesn’t matter what time of day it is – football is better watched while wearing comfy pajamas. He also was dragging his worn, fuzzy blanket to put over his legs; his clock that tells the outside temps (read my past football blogs! ); his bowl of Mike and Ikes; and his water bottle. It takes him awhile to get settled…………..ottoman just right, blanket repeatedly shaken and smoothed and placed just right, the clock put where he can see it and keep track of the ever important outside temps. And once he’s finally settled, he’ll remember something that he didn’t bring or do, and off comes the perfectly placed blanket as he gets up to accomplish a task…………only to return and repeat the whole process again. I am exhausted by the time he is finally settled. Then come the questions and the comments. “Mom, who are the Chiefs playing?” I tell him they’re playing the Green Bay Packers, and then of course he wants assurance that I’m still “voting” for the Chiefs. He makes his usual observations about the players with long hair, etc. “Mom, what’s that stuff they squirt in their mouths out of that bottle?” It’s usually water, Aaron. And he laughs and says, “Oh, I thought it was mouthwash!” Some of the players may wish that it was. One of the Packers had a leg injury and was finally driven off the field with his leg all bound in a brace. Aaron watched that with particular interest. “Mom, when that guy was hurt, they moved his leg and he acted like he didn’t like it.” I’m sure he didn’t like it at all, Aaron – it hurt! “And then that bulldozer thing came in and picked him up!” I have images of injured players being scooped up with bulldozers. Disturbing – and funny! We finished the Chiefs game and turned the channel to the Broncos and Patriots. Aaron determined that I was voting for the Broncos and he turned his attention to the symbols on their helmets. He always wants to know what the symbols stand for and I often find myself unable to fully explain it. Google, Aaron, google! As he saw the Broncos helmets, he said, “So why do the Broncos have a dog on their helmets?” No, Aaron, it’s a horse – a Bronco. “Oh, and so the Chiefs have a spear.” That would be an arrow. Remember ARROWhead Stadium that we’ve seen in Kansas City? Arrow……..spear…………who cares, right? What’s that? Indeed! Let me tell you about an awesome football player, Aaron! And so the afternoon went until Aaron lost interest, had no more insights or questions, got up and went on his way to occupy himself with his computer. Funny how quite it is when he’s gone. Kinda boring, too. Is that a bulldozer on the field?! 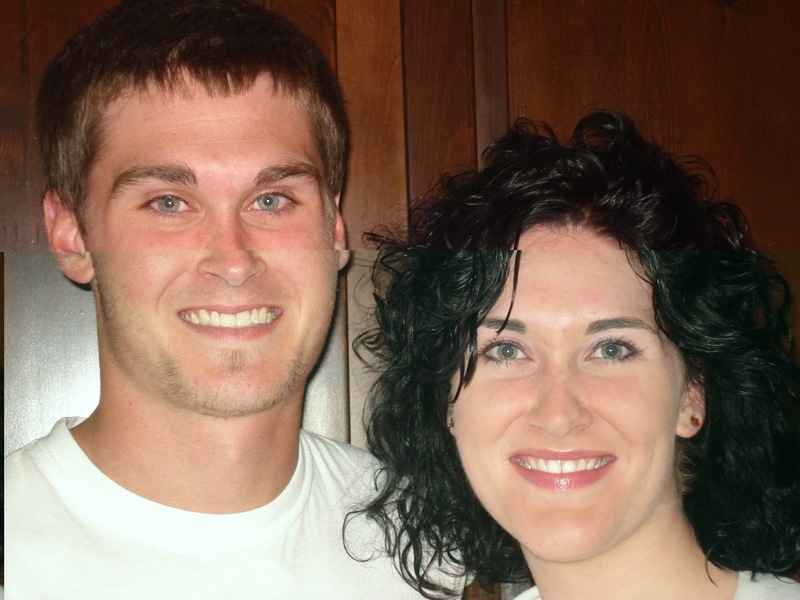 I’ve been thinking today about siblings – specifically, Aaron’s siblings – Andrea and Andrew. I guess these thoughts are on my mind because of the family time of year this is, and also because tomorrow Andrew is not only coming home from college for the Christmas break…………..but it’s also his birthday! My youngest is turning 22 and for some reason that sounds impossible to me! When a child has special needs, the entire family is impacted in many ways. The needs of their special brother or sister can be overwhelming to them as well as to the parents. We’ve certainly had our ups and downs adjusting to life with Aaron over the years. We know that God put each of us into this particular family for a reason, and God’s reasons are always good. His sovereignty in our lives gives us peace even when circumstances don’t make sense. However, each of us has had to grow in our reactions to Aaron and in our reactions to God…………..because life with Aaron has had its challenges, especially during Aaron’s puberty. Aaron is only 18 months older than Andrea. His adjustment to her addition to our family was seamless. He loved her from the first day and they were very close as they grew. When Andrew was born three years later, Aaron had a more difficult transition. I believe a big part of his uncertainty was due to the fact that Aaron was five years old and was very used to our family the way it was. Andrew was a little interloper who intruded into Aaron’s time and space. We knew when Gary brought him and Andrea to the hospital there in Germany to see me and Andrew that Aaron was struggling. We understand it better now in hindsight. We were encouraged when I got home with Andrew because Aaron ran to his room, brought me his favorite stuffed bear, and told me that he wanted to give it to Andrew. How sweet and touching that was! As the three of them grew and matured, the differences between them was more and more noticeable. 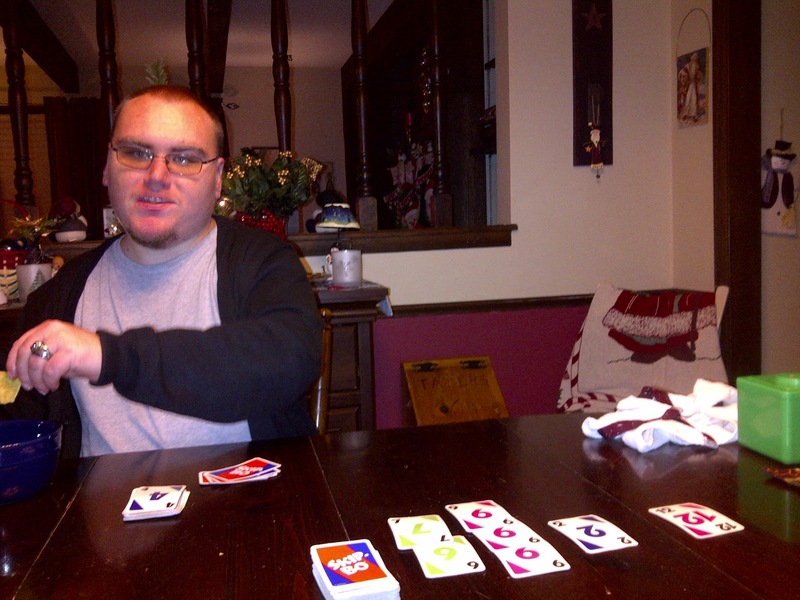 Aaron’s seizures took their toll, and the autism made him a misfit socially. He would take out his frustration by hitting Andrea or Andrew, or yelling at them, etc. Of course, they resented that behavior. All of us were struggling to figure out what was going on with Aaron and why he was so different and miserable. There were times that Andrea and Andrew thought that Gary and I didn’t discipline Aaron enough – that we let him get by with things – and they certainly didn’t respect that. Aaron’s behaviors in church, restaurants, shopping – wherever we were – were embarrassing to them. And sometimes family trips were ruined because of Aaron, or were at least altered as we had to manage him. It wasn’t all gloom and doom………….we had plenty of fun…………..but the hard times were certainly tiring for all of us. Siblings of special needs children do struggle, though, and need a higher level of understanding than those in families who don’t face these issues. Aaron has always been jealous of Andrew. We believe it’s because Andrew is a guy, so there’s the competition that Aaron feels on that level. I remember when Andrew got his driver’s license, a privilege that Aaron will never have. We decided to downplay it in front of Aaron so as not to hurt him. One day Aaron saw Andrew get in the car and drive away. Aaron looked surprised and said, “So Andrew has his license? He can drive now?” When I told him yes, Aaron was silent for a minute and then softly said, “I wish I could drive.” That one little sentence spoke volumes and it broke my heart for Aaron. He showed how much it mattered to him that he would never be able to drive, and that his little brother could do that now. When Aaron was younger he thought the ultimate friend experience was to have a sleepover. He did plenty of that when he was younger but as he got older those experiences were few and far between. Our dear friends in Arizona, the Eatons, made sure that Aaron got to come over and stay at their house. All three of their children, two of them boys, gave Aaron so many wonderful and fun times. Here in Kansas, as Andrew got older and had friends over, it was hard for Aaron to handle. He’d express his frustration sometimes by being rude or mean to Andrew’s friends. And then there was the day that a good friend of Andrew’s – a very sweet girl – came over one afternoon to see Andrew for a few minutes. Aaron bounded out of his room when this girl came in the front door, stood at the top of the stairs, and loudly asked, “Andrew, is she sleeping over??! !” Thankfully, she was very understanding and we all laughed and our faces turned red – except for Aaron, who totally didn’t get it! As the three of them began entering their late teenage years and early adulthood, their relationships have changed. Aaron sees Andrea as more of a mother figure. He’ll ask her permission about doing things and talk to her excitedly when she comes home. When Andrew comes home from college, Aaron will say, as he did this morning, “Oh no!” But today when he said that he looked at me and we both started laughing. He doesn’t really mean that anymore. He’ll say that we like to talk to Andrew more than we talk to him and we remind him that we haven’t seen Andrew in ages. Aaron is rather selfish that way. Last May, when Andrew had come home, Aaron came into the kitchen and tried to hit Andrew on the back. Andrew swerved and Aaron missed. Andrew turned to Aaron and laughed and then said, “Hey, Aaron, how about a hug?” When he started to come Aaron’s direction for the hug, Aaron backed up and said, “Uh…..uh……uh…..” HaHa! That show of love really threw him! Today I see more love and understanding from Andrea and Andrew toward their brother. More patience and more warmth in their eyes. They’ve grown even when Aaron hasn’t. The irritations are fewer and farther between, though still there at times. Gary and I love all our children equally. We are very proud of the growth that we see in Andrea and Andrew, and know that someday they will be able to look back and realize how having Aaron for their brother has been a blessing and a teacher of many life lessons. And the cause of many red faces! I asked Aaron what he wanted for breakfast and he was deep in thought. I suggested eggs – boiled eggs, specifically, which he likes the best of all egg forms. “You mean the eggs with the shells?” he asked. Yes, Aaron, the eggs with the shells. As opposed to the eggs with the yellow (fried) or the eggs that are stirred (scrambled). He can’t seem to remember the technical names of the various egg forms. So we agreed to fix boiled eggs. He got the eggs out of the frig so that when I came down to the kitchen, that part was done. He was in the family room as I opened the eggs and asked him how many he wanted. Big mistake on my part. “How many eggs are there?” he inquired. No, Aaron, you don’t need FIVE eggs. “But you asked how many I wanted,” he countered. Clever Aaron. He knew he caught me. He was laughing. There are five eggs boiling but I reminded him that I am hungry, too. And HE always reminds ME that I need to be careful about how I phrase my questions to him! You’d think I would know that by now!